I decided to make kimchi. The Korean condiment is everywhere, so I thought why not. I was bolstered by a recipe I read in Edward Lee's Smoke and Pickles. Lee is a New Yorker of Korean descent who has become one of the South's leading culinary lights. He does a uniquely American blend of Southern cooking with Korean influence. So I was drawn to a recipe he had in the book for a kimchi made of Brussels sprouts and green tomatoes. 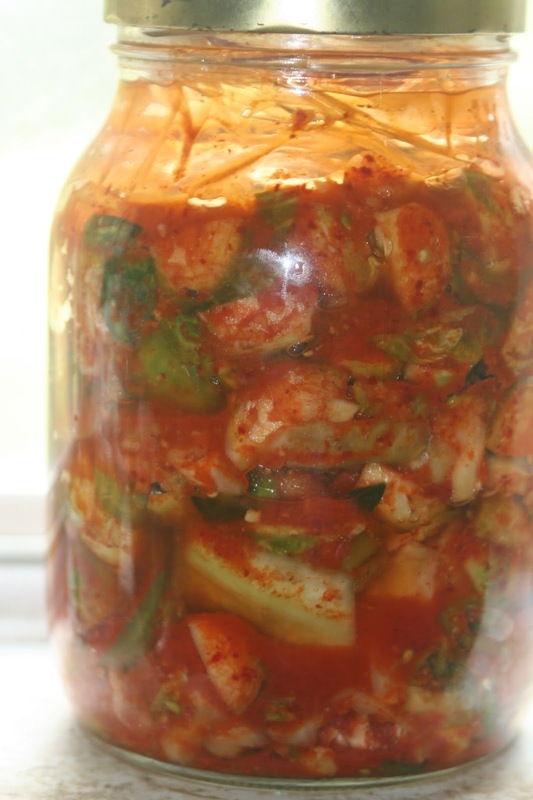 In my pursuit of kimchi, I read at least 1000 recipes and no two were alike! I ordered several forms of gochujang a Korean spice necessary for kimchi; both flake and paste form. I bought the expensive Red Boat fish sauce, favored by hipsters. I didn't have sweet, sticky, whatever rice flour. Several recipes said substitute regular flour, but some folks said it made the kimchi "floury", and some recipes said make your own rice porridge with regular rice, and still others said don't bother, so I didn't. One recipe said add an apple, and I liked that idea. I had a small wedge of cabbage, so I added that. Teddy helped with the Brussels sprouts. 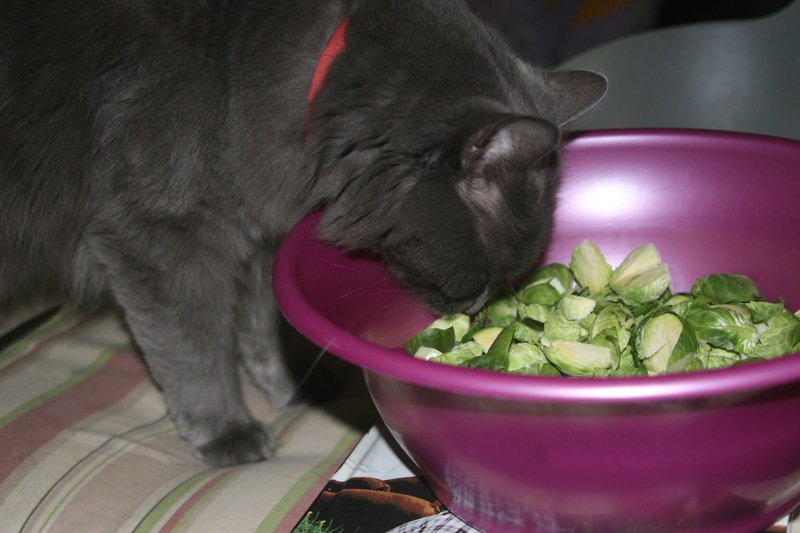 Generally, one does not have to worry about cats and cole vegetables, but for some reason, Teddy loves them. This summer I left a bowl of coleslaw on the counter, never thinking I should quickly sequester it away. I walked back in to find Teddy on the counter in the slaw. Trick was standing on her hind legs begging Teddy. He took a big mouthful and dropped it to the floor, where he and Trick happily devoured everything but a single shred of onion. So I should have known cutting Brussels spouts would cause a commotion. 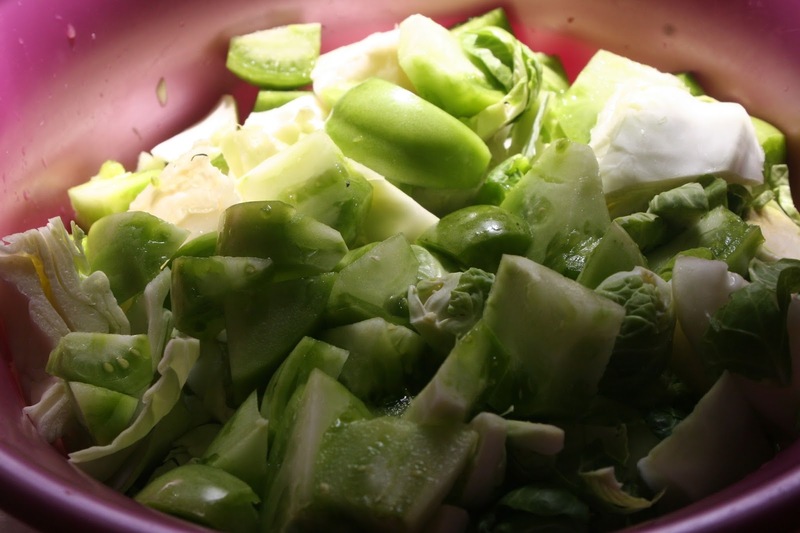 I added the green tomatoes and the bit of cabbage. Mixed it all together and let it sit. To keep the kimchi submerged in the jar, I filled a Ziplock bag with water and used it as the weight. Then I let the jar sit. Of course, every recipe gave different directions for how long to let it ferment and long to leave it in the fridge and how long before you should eat it. Mine sat out about 36 hours and has been in the fridge for several days. We are thinking that Friday we will break out the jar and taste test. We will not be leaving on the counter! What a great combination. I've been wanting to make kimchi for months.